anyone know if the top hat is a offset of .71 or 1.1? TXS FMIC, TXS CBE, TXS CAI, TXS BOV, GS 38mm EWG, 3" cut out, GS 3-port, Perrin LWP, Invidia catless DP, Walbro 255, Perrin EL, JDM long runner mani, parallel fuel lines, air pump delete, 3" inlet, 750cc, AEM MAP, Konis, RCE yellows, RH 18x8.5 +44, all bushings. 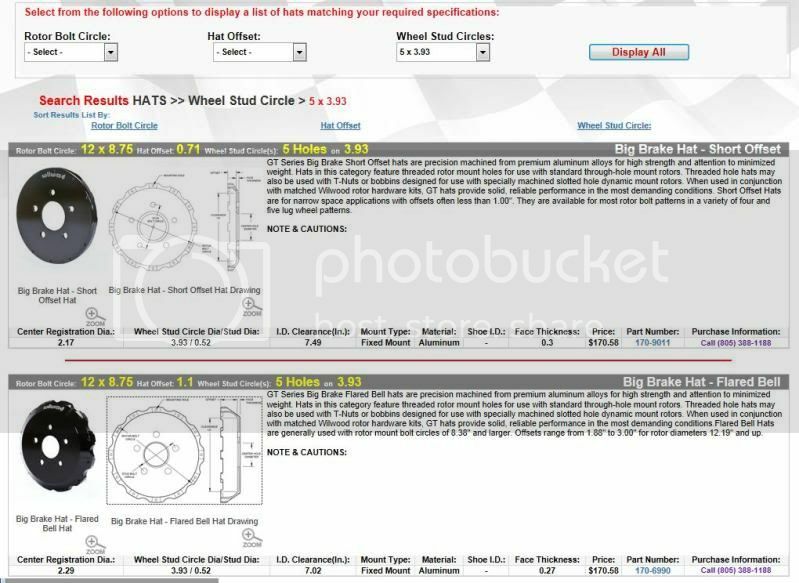 those are the only 2 listed for a 5x100 bolt pattern that will bolt to a GT-72 rotor. the other GT-72 rotor, a 12x9.19, doesnt have a 5x100 for it. although if you custom drill a 5x100 into another hat then that would explain it. id still like to know the offset just incase i do come across a blank. Ultimately the required offset would have to pair with the mount offset of the caliper for proper fit. You'd need something in the .900-.950 range. both i found were either a .71 or 1.1 so those are out. one was a viper and one was a 370z. o well saving up continues. This TCE kit, proved popular enough that: Wilwood copied it. No longer a TCE/Wilwood kit it's now a Wilwood factory kit and they went forward with the matching rear in 13" flavor also. Sorry to see the loss of exclusive design but the good news is the price is now less. Wilwood Brake Kits - Group Interest?? ?